Product Information : This tropical-looking beauty is hardy to zone 5! Exotic 3 in. 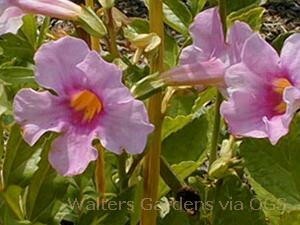 long trumpet-shaped, rose-purple flowers with a yellow throat. The medium-green leaves are long and deeply divided.